I recently met Paul Langlois–online, at least. Many thanks to Joe Friel for making the kind introduction. I’ve had a chance to chat with Paul and thought I’d share his interesting story here at the blog. Paul is a long-time recreational and competitive cyclist who developed a rare medical condition called amyloidosis. His heart was particularly affected. He developed life-threatening heart failure and required a heart transplant as the only effective treatment. He has now made a great recovery and has returned to his passion of cycling. I know that heart transplantation remains a bit of a mystery for most non-medical folks. In part, it’s just a rather uncommon operation. Last year in the United States, for example, 2,655 individuals underwent heart transplant operations. Here at the University of Mississippi, I’m involved in about 10-12 heart transplant operations each year. For the patients who need the transplant operation, the results are usually quite remarkable. It’s very unusual, though, for lifelong athletes to need a heart transplant operation. And that’s why Paul’s story is so very intriguing. He kindly agreed to answer my questions about his experience…. Thinking back to before your heart transplant, can you tell us a little about your interest in cycling? When did you get started? Were you involved in team cycling? Or competitions, of various sorts? Yes, I had been actively involved in competitive Masters cycling since the age of 30, attaining Category 2 status on the Road, Track, and Cyclocross. Before I became a cyclist, I competed in collegiate rowing at the Coast Guard Academy, winning three national titles. After college, I got hooked on the running boom and completed four marathons (qualified for Boston), ran many shorter events, and did some medium distance triathlons. Problems with my right knee resulted in two surgeries when I was 30, when I switched my competitive focus entirely to cycling, which was became part of a long rehab process for the knee. Only a few years later at age 34, I won the All-Military National Cycling Championships stage race in Colorado Springs. Over the years, I had competed at over 20 various Masters National Championship events for road, track, and cyclocross. Somewhat surprisingly, some of my best performances on the bike were attained in my early 50s, when I won two consecutive years as Best All Around Rider 50+ in the Mid-Atlantic District, and rode a Personal Best 40K Time Trial in 54 minutes. I raced with numerous amateur teams in different parts of the country, as the Coast Guard typically relocated me to a new duty station every three years. I served for 30 years in the Coast Guard, primarily as a helicopter rescue pilot, and retired as a Captain in 2006. After retirement, and settling in Santa Rosa, California, I continued non-stop racing, until a year before my diagnosis at age 56, mentioned below. I understand that you were diagnosed with cardiac amyloidosis, a rare cause of heart failure. How did you and your doctors discover this problem? It took me a bit more than one year of frustration before I was properly diagnosed. I attribute my eventual diagnosis in large part through my own keen awareness of my slow, but steady deterioration in fitness level. Initially, I noticed that I was having trouble keeping up with my teammates on training rides, especially when climbing. And then, soon thereafter, I had to pull out of a criterium race after two laps, experiencing almost no aerobic capacity, in the same race I had nearly won the year prior. I first checked with my primary care physician, who commented “I was simply getting older”, which I refused to believe was the problem. I was later referred to a cardiologist and a pulmonologist for stress tests and neither test came back with any abnormality. Over the next six months, I progressed into becoming short of breath when climbing one flight of stairs, and nearly fainting when I quickly rose out of a chair. I noticed my legs and ankles were swelling in a way which I had never seen. Finally, I checked myself into my local ER, and by a stroke of luck, a talented cardiologist was on duty who performed an Echocardiogram, an EKG, a chest xray, and did some lab work. He noticed I had very high protein in my urine, and suspected I might have Amyloidosis. The following week, I had a heart biopsy, and a special test revealed I was positive for Amyloidosis. This was the cause of my heart failing, and it readily became apparent to me that it was a life and death situation. I was referred to Stanford Hospital for further evaluation, as they have one of the few clinics in the USA with significant experience treating this rare blood disease. Once heart transplantation was recommended, how long did you spend on the waiting list? And during the waiting period, were you able to exercise? What was your fitness level right before the transplant operation? My first consultation at Stanford was with their Cardiology Dept, which recommended heart transplant, as no other option was available to keep me alive. I went through the pre-qualifying tests successfully over a period of six weeks, until I was allowed to be listed for transplant. I have Blood Type AB, and was listed as Priority 1B, and I was extremely fortunate to only have to wait for eight days until a good match was found for me. Leading up to the transplant, my fitness level had diminished considerably over the past year due to the onset of heart failure, although I still attempted to get exercise, primarily through cycling. As an example, in the months just before transplant, I was not able to get my heart rate over 130, when giving it my hardest effort, whereas the previous year before I became ill, I could easily exceed 165 during a hard effort. Tell us a little bit about your early recovery after the transplant operation. How long were you in the hospital? When did you begin walking, afterwards? How long did it take to get healed up? Heart Transplant is obviously a very traumatic surgery, including the need to separate the center of the rib cage to perform the transplant. And so the body needs many weeks to heal and rest afterward. I spent only one week in the hospital. I was up and walking slowly around the ward within three days. 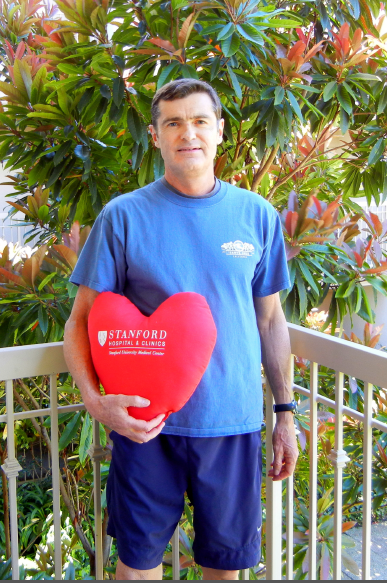 After discharge, I was required to live nearby Stanford for many weeks with a Caregiver (my wife Linda), to allow for frequent clinical check ups at Stanford, including many heart biopsies, Echos, and labwork, with a focus on ensuring no organ rejection might be taking place. I began exercising very gently at first, and then with steadily increasing intensity and distance as the weeks went by. Within one month and much to my surprise, I completed a six mile hilly walk around the Stanford Campus. I had to wear a protective mask whenever I was outside or around people to minimize any chance of catching an infection or virus. I finally got to go home at almost two months after the transplant which was a wonderful day. I understand that you’re back to cycling now. What’s your routine? Are you still competing? Yes, I have been able to get back into cycling, but have not been able to develop the required fitness to race competitively. Having said that, I still have the mental mindset to someday be competitive, and so I keep training with the belief that I may attain that level again. Unlike many who have heart transplant, my case is much more complex and challenging, as I still have the underlying blood disease to deal with, which required a stem cell transplant just six months after the heart transplant. As I approach the five year mark, I have endured almost nonstop chemotherapy treatments, and clinical trial drugs. Amyloidosis has no known cause, and still has no proven cure. My kidneys have become involved with Amyloid damage (Stage 3 failure), and I have to battle fatigue with anemia. As a result, my ability to train hard and go for long endurance is diminished compared to my earlier success. But, as an example, I was able to complete two 75 mile charity rides within two years after my transplant, and still routinely cycle 3-4 times per week, typically between 1-3 hours each session. I also spend lots of time in the gym with weight training and physical rehab, as I also elected to have a total right knee replacement two years ago, which set me back for awhile. Despite the pain, side effects from medication, and lesser ability to push myself, I enjoy getting out and riding the bike frequently. In the past few months, I have begun to challenge myself on much steeper and longer climbs, and have started to incorporate various interval sessions and sprint workouts. I am getting back into group riding with my teammates again. I have a goal to try and enter some low key racing next year in my 60+ age group, provided my health remains stable. As you know, the autonomic nerves (from the “involuntary” nervous system) that supply the heart are cut during the transplant operation. As a result, some of the usual mechanisms that influence the heart rate during exertion aren’t available after heart transplant operation. Have you noticed this? And, if so, how has this situation affected your exercise routine or training? Yes, without any question, I have noticed significant changes in how my heart beats and reacts to demands. Since denervation takes place after transplant, my new heart has a resting heart beat of about 85, whereas it used to be about 44. In the first year after transplant, I noticed during exercise that it would take me about 20 minutes to get my heart rate to a maximum of 120-125. And then, once I eased off the intensity and started to rest, the heart rate would not drop down very quickly. But as the years have gone by, and I have trained consistently, my new heart responds to effort much quicker, and so I can get my heart to rise up over 120 in less than five minutes, and my maximum heart rate after climbing a long hill is about 155. And when I slow down, the heart rate drops much quicker than the first year, but not nearly as fast as when I was in great shape with my original heart. My resting heart rate has not dropped with time, and it remains just above 80 at its lowest resting rate, which I am told is quite normal for heart transplant patients. When I ride, I try to warm up gradually for the first 15 minutes, before applying much intensity, and I have found that I tend to really feel much better after about one hour on the bike. But, I also can report that I do not recover nearly as fast as I used to after a long workout, and so I typically do not ride on consecutive days, to ensure I get sufficient rest and recovery. Recipients of organ transplants must take anti-rejection medications, usually forever. These medications sometimes hinder the body from dealing effectively with infection. Has this issue affected your cycling? Do you have strategies to prevent illness? Yes, I definitely have concerns about having to take two different immuno-suppressant medications every day, supposedly for the rest of my life. On one hand, they serve to prevent organ rejection, but on the flip side, my body is much more prone to catching virus and various illnesses. As an example, I had a very difficult year last year (2015), when after the total knee replacement, I came down with shingles all over my body, which took over a month to clear, including hospitalization for a week. Following that episode, I came down with pneumonia, which had me inpatient in isolation for two weeks, and didn’t clear until two months later. If that wasn’t bad enough, this past April, my spleen ruptured due to Amyloid involvement, requiring an emergency splenectomy. While not all of these may be attributable to the anti-rejection drugs, I believe these medications make my body very fragile and less able to fight infections and germs. As a result, I try to be very careful to minimize exposure, especially in public places around large gatherings. I constantly wash my hands and avoid people who appear to be sick. My predicament sometimes means I have to avoid certain social situations in order to lessen my exposure. I wear a protective mask whenever going into hospitals or clinics. I have learned that winter time is a very high risk time for me, so I ensure extra precautions, especially during the Holidays.